This project was previously Exploratory Project 3 and evolved into Interface Project 13 in 2017. Gravitational waves are a prediction of Einstein’s theory of General Relativity. They are ripples in the space-time metric produced by cataclysmic astrophysical events. The direct detection of gravitational waves provides not only an important test of General Relativity, it also represent a new way to observe the Universe. The detection principle is based on the measurement of the space-time deformation between test masses with high-precision optical interferometers. The sensitivity of those instruments is limited at low frequency by seismic noise, due to geological and human activity. Geological activity affects the interferometric detectors, and conversely – for the same reason – the interferometric detectors can be used to extract information on the geological activity. The goal of this project is to explore the possibility to use the data of the Virgo interferometer to extract useful geophysical information. This project started with a completely exploratory nature. The first success has been to allow exchanges between the APC and IPGP geophysical and gravitational communities to explore new ideas and methods. 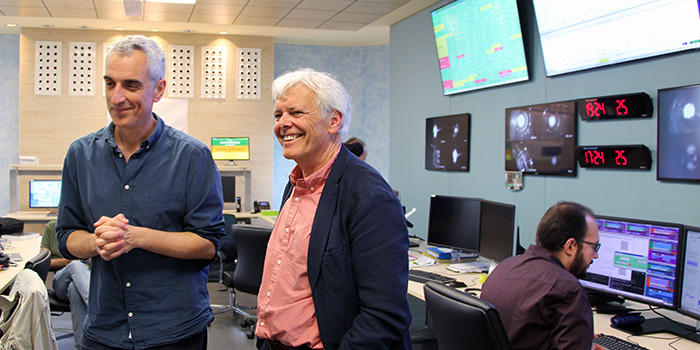 Moreover, around our APC-IPGP team, several international collaborations have started, both on the geophysical side (Prof. Ampuero, Caltech-seismolab) and on the gravitational wave side (Prof. Withing, U.Florida and Dr.Harms, INFN-Urbino). During this first exploratory phase (2012-2014), we analysed some research possibilities (use of Virgo as inclinometer and long base extensometer, study of gravity gradient noise, study of gravitational disturbances due to earthquakes). We then identified an original research direction: the detection of rapid gravitational disturbance produced by mass redistribution during earthquakes, and its potential application to improving early warning systems for earthquakes. See the article “Tiny changes in Earth’s gravitational field could help predict tsunami’s size”. While research continues, a documentary film is being produced to present the results obtained by the I13 group to the general public: “NAMAZU”. The motivation behind this film is twofold. First, explain to a wide audience these latest developments in seismology and how they could help reduce the damage caused by large earthquakes. And two, tell the story of a close and fruitful collaboration between geophysicists and gravitational wave physicists. This project is truly a major illustration of the power of interdisciplinarity and the ability to generate new ideas by combining different points of view on the same subject, an idea that is at the heart of the collaborations promoted by UnivEarthS. Collaborations with J.Harms (INFN Florence), B.Whiting (Florida University), J.-P.Ampuero (Caltech), M.Ando (Tokyo University), F.Sorrentino (INFN Genova). This project started with a completely exploratory nature. 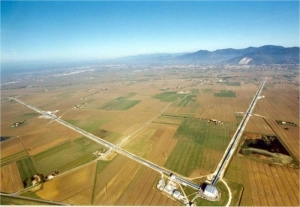 The first success of the E3 WP is to have allowed exchanges between the geophysical and gravitational-wave communities at APC and IPGP in order to explore new ideas and methods. Moreover, around our APC-IPGP team, several international collaborations started, both on the geophysics side (Prof. Ampuero, Caltech-Seismolab) and on the gravitational-wave side (Prof.Whiting, U.Florida and Dr.Harms, INFN-Urbino). During this first exploratory phase (2012-2014) we have analyzed a few research possibilities (use of Virgo as long-base tiltmeter and strainmeter, study of the gravity-gradient noise, study of the prompt gravity perturbations due to earthquakes). We have then identified an original research direction: the detection of the prompt gravity perturbation produced by the mass redistribution during earthquakes, and its potential application to the improvement of earthquake early-warning systems. The first results, demonstrating the detection of the prompt gravity signal at 99% using a superconducting gravimeter at Kamioka and a japanese network of F-NET seismometers are summarized in the publication: Prompt gravity signal induced by the 2011 Tohoku-Oki earthquake, J.-P.Montagner et al. – Nature Communications, DOI:10.1038/natcomms13349 (2016). See also the CNRS press release: http://www.insu.cnrs.fr/node/6165. 2) First analytical computation of the prompt gravity signal by an earthquake. The prompt gravity signal has been computed by an original analytical model, validated with numerical simulations. Journal International: Normal mode simulation of prompt elastogravity signals induced by an earthquake rupture, K. Juhel, J.-P. Montagner, M. Vallée, J. P. Ampuero, M. Barsuglia, P. Bernard, E. Clévédé, J. Harms and B. F.Whiting, Geophys. Journal International (2018, in press). From points 2 and 3 and from the finding of the Tohoku-oki earthquake analysis, we have demonstrated that conventional instruments (seismometers, gravimeters) cannot be used to detect medium size earthquakes (M~7) in ~ 10 seconds. New instruments, measuring the gravity strain and immune to seismic noise are necessary. The sensitivity needed is h ~ 10−15 Hz−1/2 at 0.1 Hz. These instruments do not exist, but prototypes (torsion bar antennas, atom interferometers, superconducting gravimeters) are developed in the context of gravitational-wave detection. A preliminary study of the implementation of an early detection system of seismic ruptures based on gravity has been carried out. This study assumes the availability of a TOBA high precision instrument, and will seek to optimize the detection performance of a network comprising these instruments. First, a database of seismic ruptures is simulated to detect events of varying durations, either still in progress or whose rupture has already been completed. The location of the different instruments is drawn, and the configuration leading to the optimal detection must be estimated. (2016). The rupture detection will be performed in “real time”, correlating each record of the network to the database, and comparing the value obtained to the reference coefficient during a calm period. If the value obtained exceeds a fixed threshold, imposed so that the rate of false alarms is acceptable, the detection is carried out. Once the detection is performed by the network, the location and the amplitude of the source are searched for. The search for the location of the source point is performed on a grid grouping the risk areas, according to a least squares error minimization method. The magnitude is then obtained at the most probable location by estimating the scale factor between the database (whose amplitude of the sources is known) and the “recorded” data. An alert will then be issued on the estimated magnitude imposed. 1) Continue to exploit current seismometer and gravimeter data to look for prompt gravity signals associated with large earthquakes (> M8.0). Develop data-analysis strategies to improve the signal detection for smaller earthquakes, using coherence or stacking techniques across a network of seismometers and gravimeters, and the a-priori knowledge of the gravity perturbations from the numerical simulations. Develop real-time monitoring strategies to detect prompt gravity signals with a network of seismometers, and complement existing techniques on early magnitude estimation. alert time and earthquake position/magnitude estimation through more sophisticated data analysis techniques. 3) Develop a conceptual design for a gravity gradiometer with seismic isolated test masses, and prepare an ERC synergy project with other EU partners, which will be submitted in fall 2019. In addition, we would like to continue the use of Virgo data for geophysics. The aim is to find signatures of local earthquakes in new Virgo-LIGO data and to exploit the long baseline and very high sensitivity of the instrument network to bring additional information to existent detectors.